During one of the online discussions in PoS, Norm told the story of how he and his wife were standing around the funeral parlor by themselves when their son's funeral was finished. All the people had left and just the two of them remained. He said he felt like he had been dropped off at a bus stop and didn't know what his next destination in life was to be. 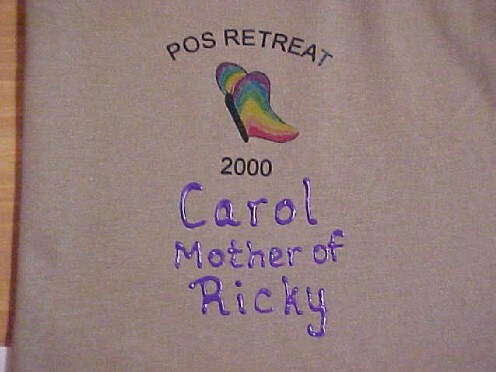 This remark occurred at the same time the Retreat was being planned at Karyl's home in Pavo, Georgia. 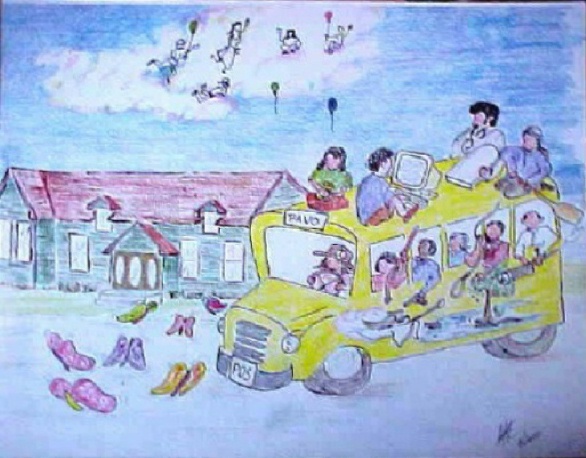 As sometimes happens, a visual image appeared to me of all of us parents hopping a bus - destination Pavo - with some of our coping mechanisms aboard as well as the reasons we all were on that bus - the methods of suicide that our children had used. Norm expressed his vision of this bus as a black bus, but black, of course indicates mourning in my mind. So, instead the happier yellow of the bus, to me, indicates that there is hope for each of us in our pursuit of answers and some promise that happiness may return to our lives in spite of the loss of those we really loved. I like to think our kids have met each other wherever it is they have gone to, and watched us gleefully from above as we processed our grief in Pavo, no doubt embarrassing the hell out of them in doing so. The butterflies in front of the bus, led us to Pavo and Karyl's newly painted green and purple house, much as she has led the PoS group. The angel and trumpet on the side of the bus were there, because the cyber conversation from someone said that's what they had envisioned on the bus. Whenever I have shown this picture to others, the methods of suicide - hanging out the window of the bus - are generally the last thing that is noticed by the observer. This was unintentional on my part, but perhaps a sign that no matter what method of dying our kids chose, in the bigger picture, it is not as important as to seek some happiness for ourselves and recover as best we can from our devasting role as PoS. The design on my shirt represents a visual image of circumstances, people and an event-all bound together by the suicide of a son or daughter. On June 30, 2000 a group of people met face to face for the first time. They had become fast friends already, via an online group called POS-Parents od Suicide. 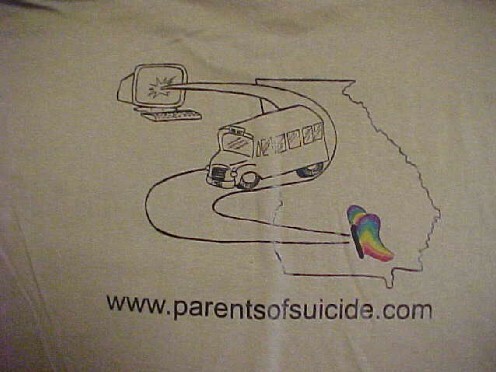 The price of admission to POS is a high one: all members are surviving parents of children who have committed suicide. POS provides a forum in which we can openly discuss our grief, guilt, questions about the death of our son or daughter, and especially our love for our children. For many of us it has been a cyberspace lifeline and instrumental in our own healing. The bus bursting out of the computer represents the feelings expressed by one member, as he stood alone with his wife after the funeral service for his son. He told her that he felt like he had been dropped off at a bus stop and no longer knew what destination in life he would follow. The road the bus travels represents the road we follow in the attempt to once again find some meaning and purpose in our own lives. 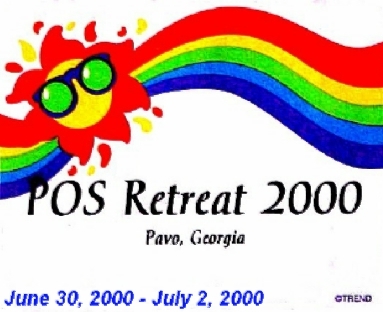 The state outline, of course is Georgia, where the first retreat for POS was held. The butterfly and it’s rainbow of color represents the spirit of our sons and daughters, who though they are no longer physically with us, remain “Forever” in our hearts and minds. Droplets of water---symbolizing the tears we shed.